Following seven days with the Bentley Continental GT Convertible V8, here are my thoughts on the car. Patiently waiting for the Bentley to be delivered, I was very pleased when I heard it coming up the road, before I could even see it. And once I could see it I was blown away by its road presence. Taking a look around the car on delivery, I was impressed at first sight, and looking up close at all the details left me a little dazzled. The first trip out with the car was actually dropping the driver to New Street Station in Birmingham. 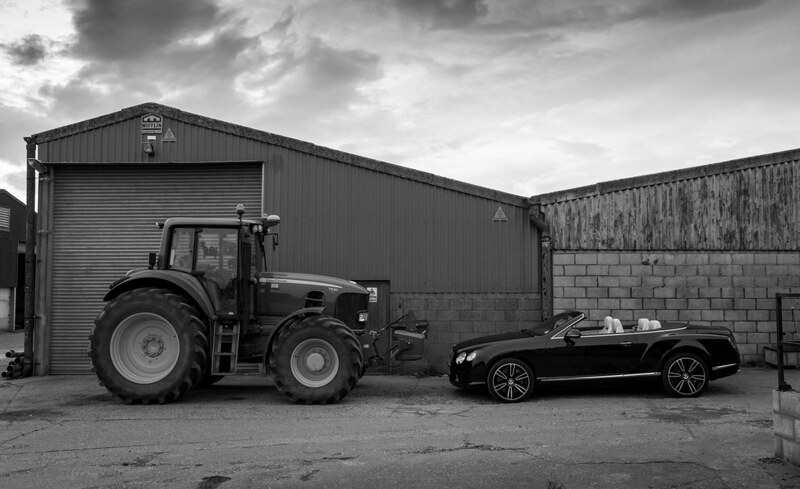 It was a great opportunity to spend a little bit of time with someone who drives various Bentleys for a living, it worked out well and I got a cheeky demo of the car’s features on the way. One of the things I noticed fairly instantly was just how well isolated the cabin is from outside noise, for a soft top convertible it is pretty impressive. After spending a day with the Bentley Continental I was starting to enjoy the car even more, and was able to start to explore its capabilities a bit more. The GT convertible is powered by a 4.0-litre, twin turbocharged, V8 engine that creates 500bhp and 660Nm of torque. The car will get from 0-60mph in 4.7 seconds and will go up to a top speed of 187mph. All of that power is very impressive, but when it is put through an eight speed ZF gearbox to all four wheels is when things really start to get a bit more exciting. 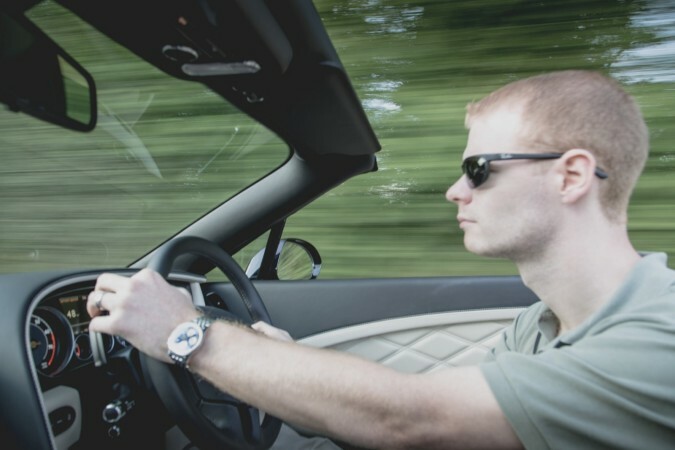 From the driver’s seat you are fully aware that you’re in a luxury car, but the performance is still as exciting and as thrilling as a less refined track car. 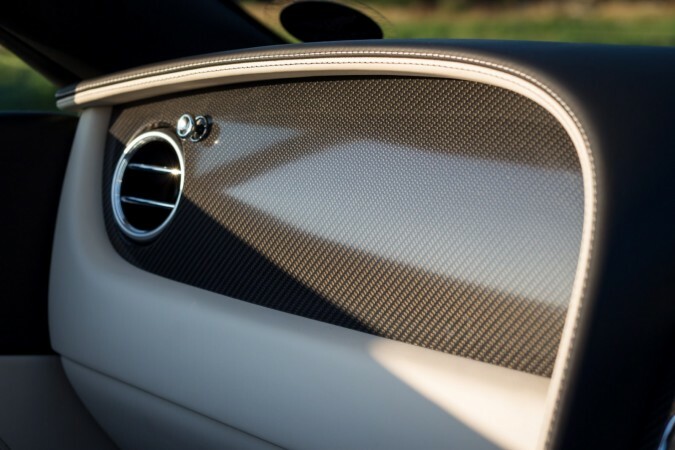 Start the car using the start button on the carbon fibre covered central console and put the car into drive using the automatic gear selector, then simply drop the electric handbrake and you’re off. 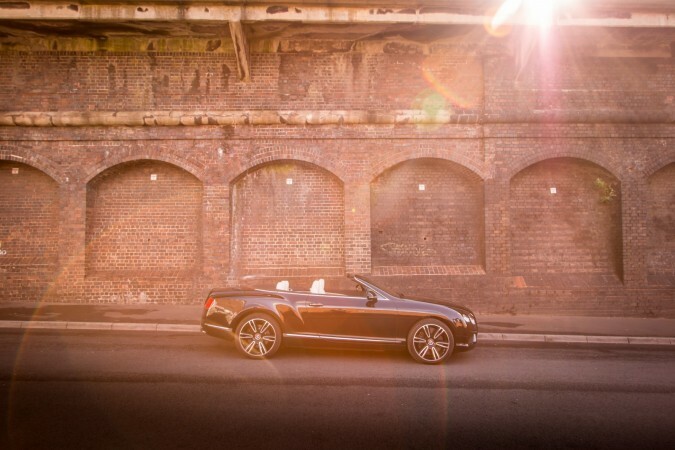 With the roof down you will hear that engine in full surround sound. The V8 creates a powerful low grumble, that is to die for when you have your foot to the floor, and even when you’re gently moving along the note is pitch perfect. The GT is lightening quick, the engine puts out lots of usable torque to all four wheels and the shift times are in the milliseconds before you’re back on the power. Brilliant! 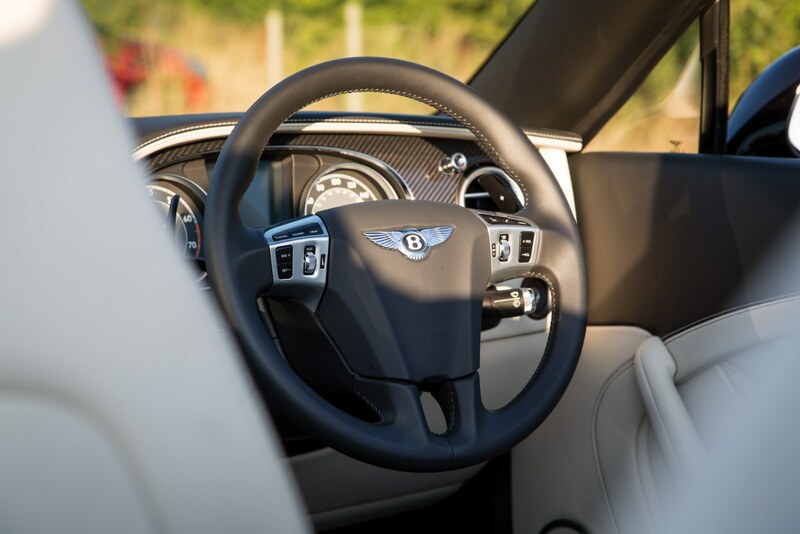 The Bentley GT interior design is absolutely amazing, there is just so much to like about it. For me one of the best features on the inside is the Diamond quilted leather seats; front and back. 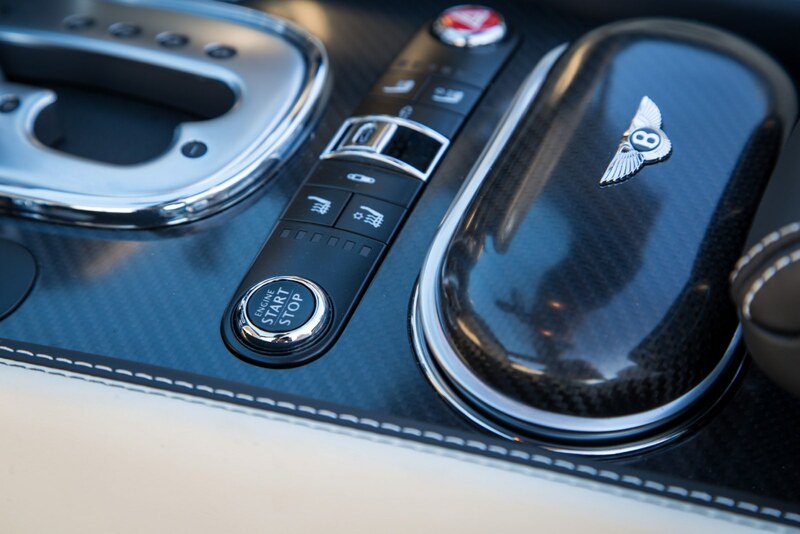 It’s a sign that you are in a Bentley, but also really just helps give a premium look and feel to the whole interior. Once you touch the leather you notice it is super soft and is an absolute premium luxury to compliment a very special brand. There are a few more special touches inside the car including a £4,040 option to have elements of the dashboard replaced with carbon fibre, I think this also really helps create the perfect interior feel and I definitely prefer it over the gloss black or wood effects. 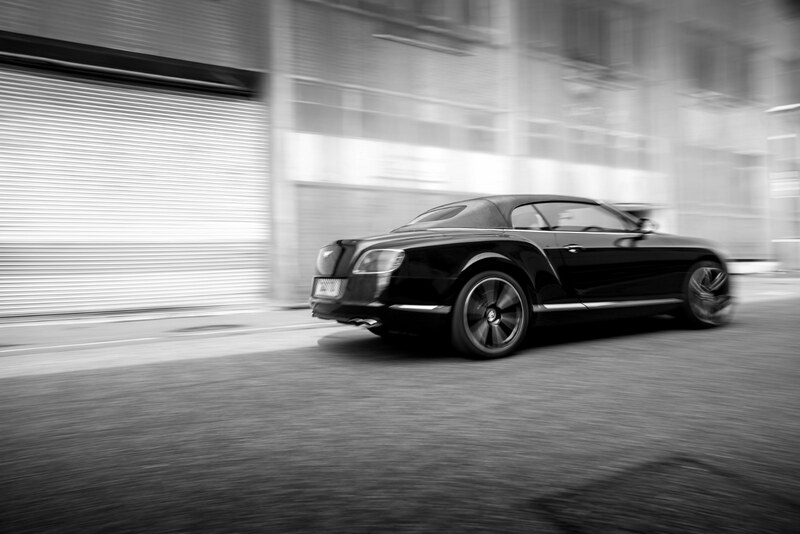 The Bentley is absolutely ram-packed with technology, I guess as you would expect for the price tag. But there are a couple of key features which, from my point of view, really were fantastic. One of my favourite features of the car was the adaptive cruise control system. 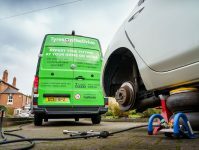 Once enabled, the system automatically detects the car in front of you and is able to track the speed of that car to keep a set gap, in seconds, between you and it. This means that whether you’re on the motorway or going to town in 20mph traffic, you really only have to steer the car in the right direction and the adaptive cruise control system will brake and accelerate for you up to the set speed. Driving just got a whole lot easier! Other features included the electrically operated boot that will open and close for you at the press of a button, a rear parking camera and parking sensors, and keyless entry and start meaning that you can just keep the key in your pocket and forget about it. 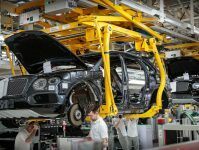 And these are on top of standard features that we have come to expect such as automatic lights, automatic wipers, and adaptive air suspension. 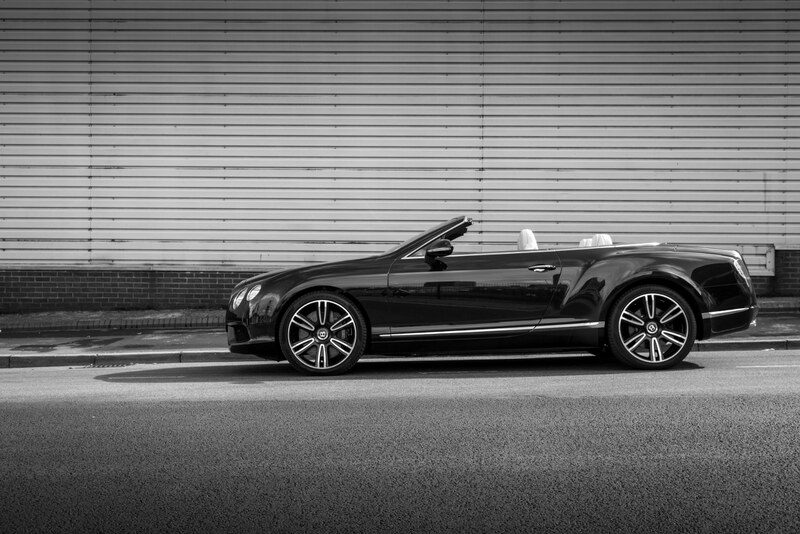 I’m not typically a fan of convertibles, maybe because I’m 6’4” and my head tends to stick out a bit, but somehow the Bentley won me over. 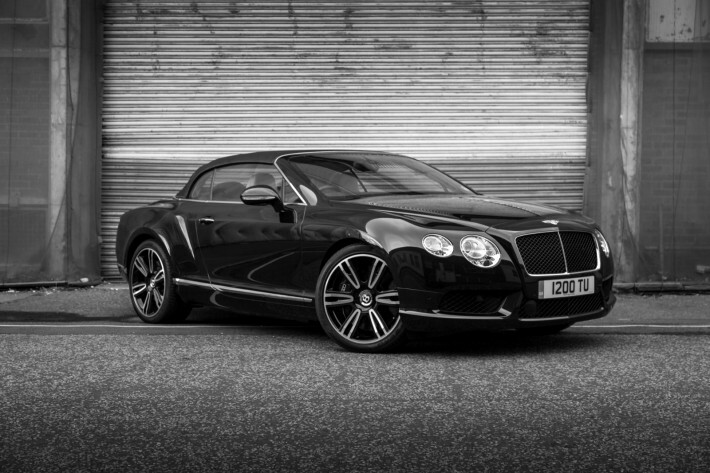 I have previously driven the Bentley GT speed coupe and I simply loved the design and usability of the coupe version of the car. But I didn’t realise what I was missing was the ability to listen to the exhaust and its full wrath. 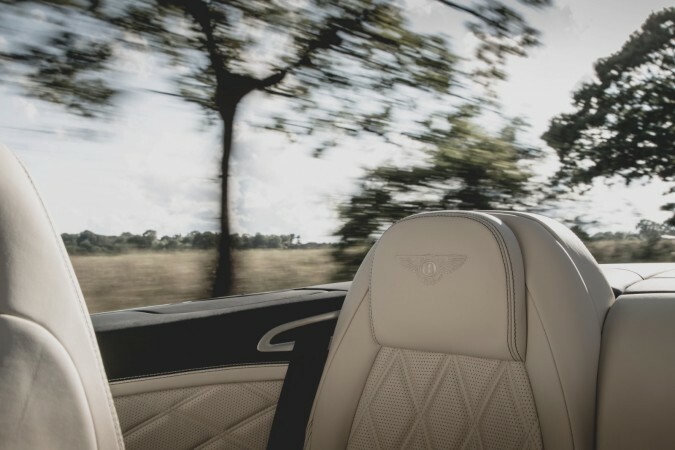 The convertible removes barriers between your ears and the exhaust and whether you have the V8 or the W12 engine the noise that comes out of the rear is toe curlingly good. So I found myself with the roof down as much as possible, mainly to listen to that exhaust note. The conversion process of roof on, to roof off is very simple; press and hold one button when the ignition is running, or use the key fob when outside the car, and it only takes around 20 seconds to complete the transformation. 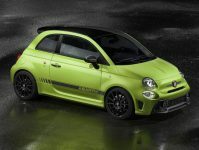 With the roof removed the design is even more spectacular, and there are no ugly components that are left exposed that might put you off the convertible version. I still think I would have the coupe, but I think I would find it difficult to choose between the two now. 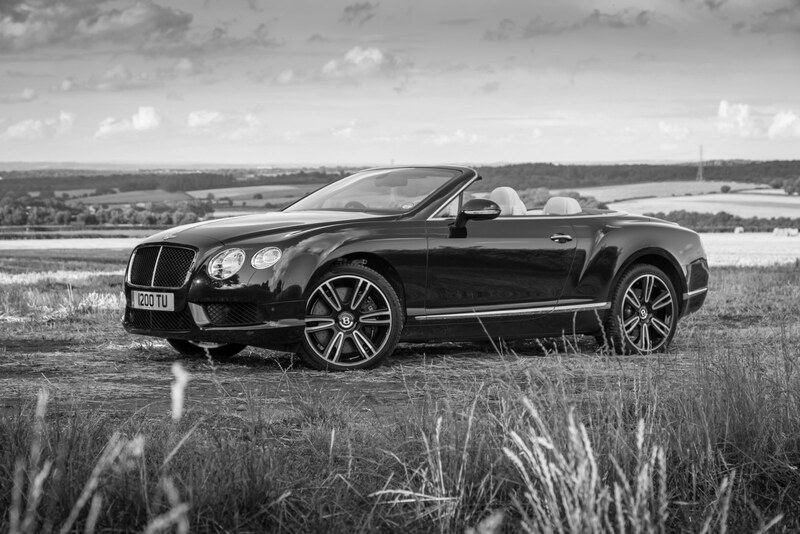 At £195,270 the Bentley GT convertible V8 is not a cheap car by any standards. 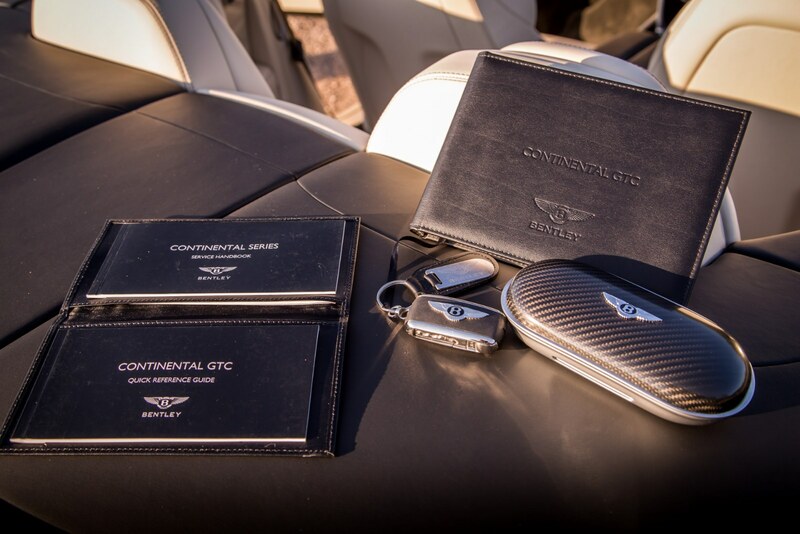 The design concept looks just as premium as the price tag, and people are very aware when they see the Bentley GT that it is at the very top end of the market. During my time with the car I had a lot of conversations with various different people, some I knew, and some who had just come to talk to me about the car. One of these conversations was with a trolley assistant at a supermarket, he approached me as I got back to the car wanting to discuss the car with me, he repeated what many other people had said to me in other conversations, that the Bentley GT is his dream car, and it is something that many people aspire to own one day, and I think he’s right. I’m quite certain that it could possibly be the staple car people look to be able to afford one day, almost as if you can picture it pinned on people’s walls as they plan their way to earn it. It takes a great brand to create something that powerful. Getting up at 4am to go and take pictures of a Bentley is not everyone’s idea of fun. However, myself and Ross Jukes don’t mind it so much. On-site by 4.30am with cameras set up and waiting for the correct lighting was a great opportunity to spend some time looking at the car and contemplating the thought process of each design detail. You can see from the pictures just how good the car looks; with the roof on or off, the GTC is a wonderful example of automotive design. 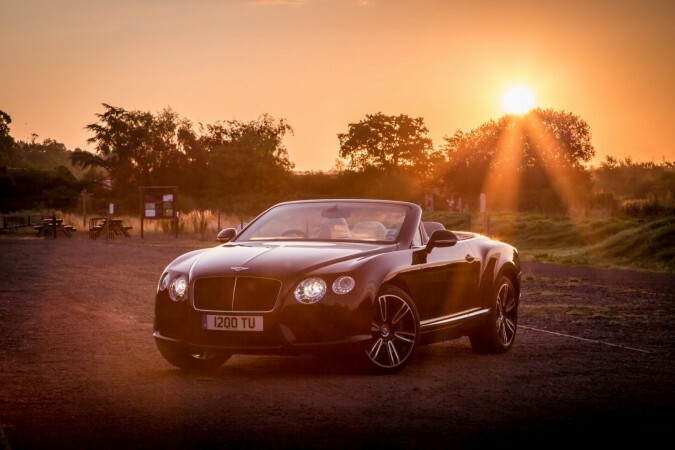 With the right lighting, the Bentley looks absolutely fantastic and you can really appreciate why so many people aspire to own one of these cars one day, including me. With one photo shoot left to do with the car, we took it to a working farm to get some interesting shots of the car. Bringing the car into this type of environment was a great way to express how dynamic the car can be in any environment. 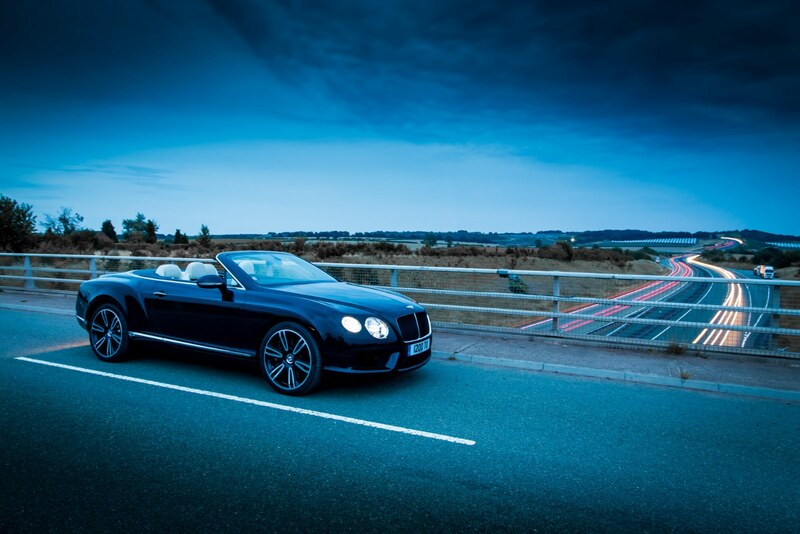 Taking the car home from this photo shoot was my most memorable time in the Bentley Continental GT V8. It was around 9pm, the sun had gone down, the air was still warm, and the roof was off. It being the last day with the car, we did what any two young car enthusiasts would have done; we went the long way home. With the roof off and listing to that V8 roar as we sped up and slowed down through the country lanes it was a really fantastic experience and really helped to bring home the whole reason for buying a convertible. The thrill of being in the open-air, listening to that V8, and taking in the environment around you is just unbelievable.